Meet Up with Strangers: Why Not? Did I ever wrote that I do really love meet up with new people? 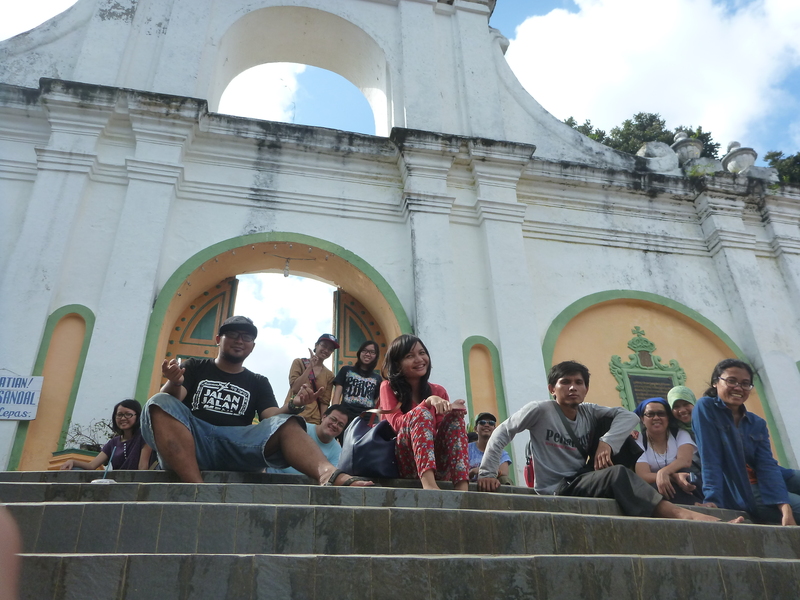 The only reason why I love to do that because I feel content every time I talk to them, include bloggers and travelers. And beside bloggers, I always love meet up with the new friend while I did a travel. 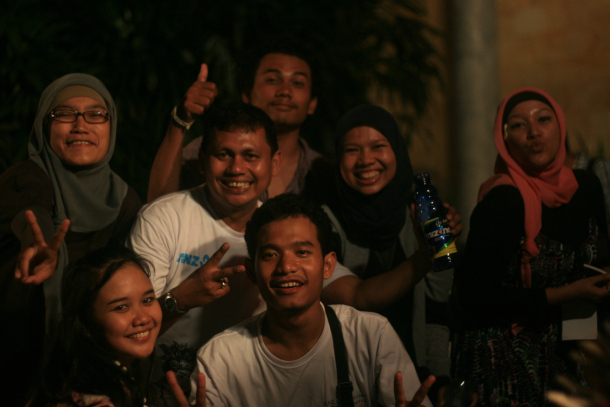 I still remember when I was joined as volunteer in Ubud Writer and Reader Festival 2011. I arrived in Bali on 10 pm, and suddenly one young lady say hi to me, “Deva?” and I was like, “Yes?” and still wondering, who is she. Ah! On that moment, I really blamed my short memory, how come I didn’t remember her face! Trina is one of the new friends that I know from UWRF 2011. And until now I still keep contact with the others. Share the stories, the knowledge and sometimes share the job also. Hahaha…that’s the power of networking, yes? After 4 years finally we can keep contact again. Horray! So once again, meet up with strangers: why not? True that! Opening up to new people (strangers) actually makes us realize there are so many good people in the world! Totally agree, Ko! Soooo many good people around the globe but wait, it depend on ourselves…do we want to open ourselves or not. Iya gak sih? aahh, kerennya jadi panitia UWRF! Hear hear! I love meeting new people. And somehow, by being open to meet new people, we kinda grow a special ability to guess the compatibility with others even before we meet. Ya gak sih? Iyaaaa.. Ato kemudian ketemu A yg adalah teman B yg jg kenal C blablabla. Hahahaha. Hahaha don’t you think the same, Bulan? 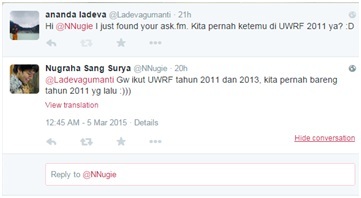 Seru ya UWRF itu? Sekilas baca ceritanya here and there. Hm.. berarti ini Ladeva yang di grup ya? By this story, anyone can make friend with you easily. You look like interesting one to talk with. Hopefully yes. But still I am not that perfect. Still learning to be a better person every day. #tsah. You’re awesome, Mbak, meeting new people, having been a volunteer in such a great event–you just make me awesome with your openness and easy going–ness. Do you never experienced awkwardness when meeting new people, Mbak? :hihi. blaming your memory…hahaha… I often do something like that.